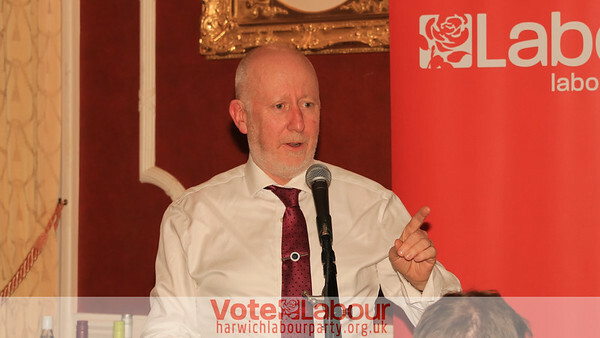 Harwich Branch Labour Party is very pleased and very grateful to Labour’s front bench spokesman for Transport, Andy McDonald MP, for agreeing to visit Harwich in order to see for himself the issues affecting two of our major port related employers. The Branch is delighted that Andy McDonald ended his visit meeting local Labour councillors and branch members and giving a keynote speech at a Labour fund raising dinner at the Tower Hotel. This entry was posted in Cause, Elections, Event, Fundraising, Media, News and tagged Andy, Branch, Dinner, event, Fundraiser, Harwich, Labour, McDonald, Minister, Shadow, Transport. Bookmark the permalink.